What is a minimum wage? Minimum Wage is defined as the minimum amount of compensation that labours must receive under the law. In public economics, it is often treated as a measure to tackle poverty by ensuring all workers can enjoy a minimum level of income and living standard. Despite this, many economists regard this policy as inefficient and ineffective. What are the drawbacks of a minimum wage? The answer is simple. Let’s start with a simple Demand-Supply diagram. Assume the economy is at equilibrium point E0. Minimum wage functions similarly to a price floor so that Wm (the minimum wage) is greater than the equilibrium wage W0. 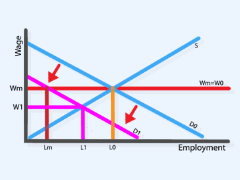 At Wm, quantity demanded of labour is lower than the quantity supplied of labour, and the distance between them is known as unemployment in the labour market. Imposing a wage level higher than the equilibrium wage level will disrupt the price mechanism and means the market won’t be able to clear, i.e. there will be labourers that won’t be able to find work. As a result non-price competition, such as worker’s age, experience or even personal connection, will supersede the price competition, making it more difficult for younger and unskilled labourers to find work. Thus, a minimum wage will have side-effects which can cause a lot of damage to the economy’s labour market. Someone may argue the above problem can be solved by setting the minimum wage rate exactly the same as the equilibrium level. This suggestion is smart, but not good enough. In reality, demand and supply are dynamic. Assume there are two time periods in an economy. When time = 0, Wm = W0. Everything is in equilibrium and therefore everyone who wants to work is employed. However in time = 1, there is a reduction in the demand for labour. The demand curve shifts downwards to D1 and the equilibrium wage and employment level falls to W1 and L1. With the restriction of minimum wages, at time =1 Wm is greater than W1 so we have the same issues as before. Employers are legally required to pay the same wage level to workers so in order to cope with the change in market conditions they will have to fire some of their workforce. Thus unemployment is created which is shown in the graph below as the difference between Lm and Lo. While a minimum wage can be ineffective and inefficient, it really depends on the type of market the minimum wage is imposed on. It can be good for workers and society if a minimum wage is able to secure a higher wage and employment level in a monopsony market. Moreover, the disadvantages of wage rigidity can be overcome by evaluating the minimum wage level more often, although this does involve other transaction costs if policy-makers re-adjust the wage level too frequently. Other empirical studies show that a minimum wage helps reduce labour turnover and improve organisational efficiency, with just a slight rise in labour costs and no significant change in the unemployment rate. All in all, a minimum wage can have both disadvantages and advantages to the economy its being used in. Demand – The quantity of a good or service that people are willing and able to buy. Labour force – The labour force is the total amount of people who are willing and able to work. It is also referred to as the number of employed people plus the number of unemployed people. Monopsony – Literally meaning ‘a single buyer’. Buyers with monopsony power have some control over their suppliers and can force them to reduce prices or lose their contracts. Price floor – This is a market intervention in which the government makes sure that the price of a good or service stays above its market equilibrium (free market price). Supply – The quantity of a good or service offered for sale.